Few places in the United States have experienced so much new development activity in a one-square mile area. 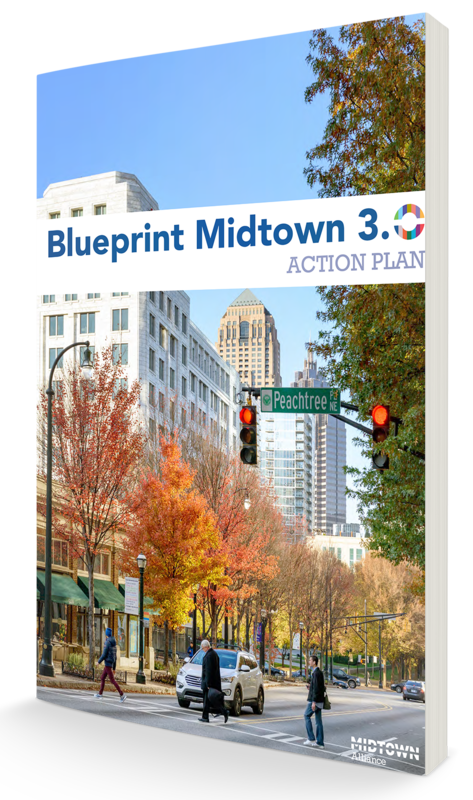 What does it mean for Midtown? Developers can receive bonus incentives for affordable housing, public art, public park space, green building and adaptive building reuse. The use and amount of parking is minimized by bonus incentives for buried parking, greatly reduced parking and public parking; along with further regulation on the maximum number of parking spaces and location and size of any surface parking. The visibility of parking structures is minimized in that they must be designed to be wrapped with active uses at street-level (such as having retail or residential units) and blended into buildings with architecturally compatible materials above street level. By year end 2017 active construction constituted 21 projects totaling 2,000,000+ sf of office, 240,000+ sf of retail, 800+ hotel keys and 3,000+ residential units. Staff and training to ensure public realm improvements by development projects are in compliance with relevant district requirements, catch problems early, troubleshoot inconsistencies between permitting and construction and identify compliant solutions. The Midtown Art Walk will create a unique pedestrian experience punctuated by creative landscape, lighting and interactive artistic elements along a half-mile walk between the Midtown and Arts Center MARTA Stations.